“Hola” once again fellow fans of the amazing Amazon, and welcome back to Classic Wonder Woman, Precinct1313’s weekly comic cover countdown to the 75th anniversary of Diana of Themyscira. This week we present you with; Wonder Woman (Volume 2) #36. Written by George Perez and Mindy Newell, with cover and interior art by Chris Marrinan and George Perez. Released in November 1989. One of the Amazon’s most revered and ancient traditions The Feast Of Five, is celebrated every year to pay homage to the five patron goddesses of Olympus who were instrumental in their creation. Apart from constant prayers and reverence to their creators, the occasion begins with a hunt, in honour of the goddess Artemis. This is followed by a harvest in praise of the goddess Demeter, after which a feast is held to eulogise their remaining creators. The Feast Of Five not only commemorates the goddesses who created the Amazons, but is also recognised as a holy birthday for the entire Amazon race. 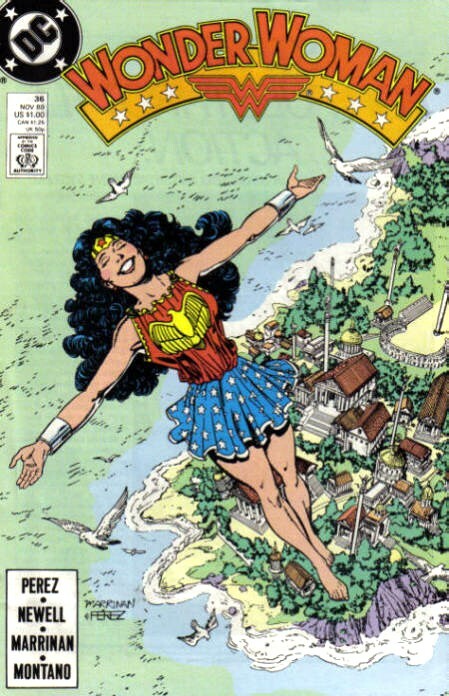 Join us again next week for another classic WW cover, my admirable Amazonian associates! Welcome back once more, to another instalment of Classic Wonder Woman, Precinct1313’s weekly comic-cover countdown to the 75th anniversary of everyone’s favourite Amazon superhero. This week we delve into the Amazonian archives to bring you; Wonder Woman #216, Written by Elliot Maggin, with cover and interior art by Nick Cardy and John Rosenberger, released in 1975. 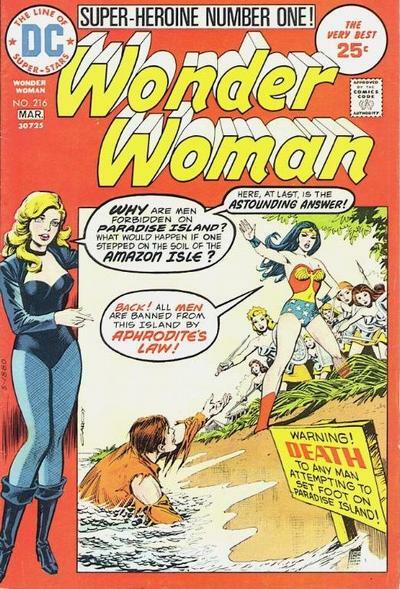 The story retained behind this classic cover, titled ‘Paradise in Peril’, tells the tale of a famous Greek tycoon’s attempt to set foot on the forbidden shores of the Amazon island of Themyscira, to assess what happens when man breaks Aphrodite’s law. His attempt is monitored by Diana’s fellow Justice League member Black Canary, who recounts the story throughout the issue. 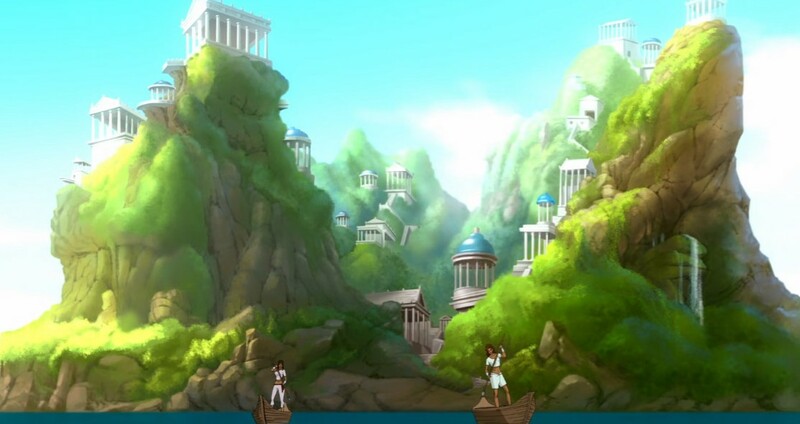 The paradise island of Themyscira is the second home of the Amazons after they were displaced from their original Greek state by demi-god Heracles. The Amazons were forcibly removed from the splendour of the original Themyscira City and enslaved by Heracles and his men and their Greek home state was burnt to the ground. Imprisoned Amazon Queen Hippolyta wept for her subjugated people and pleaded to the Gods for their salvation. Her prayers were answered by the Goddess of wisdom Athena, who pledged her support to the Amazons if Hippolyta sought revenge on her captors. The Amazons broke free of their shackles and escaped, though many of them refused to continue to worship the Gods of Olympus, feeling betrayed by their lack of intervention during their ordeal at the hands of Zeus’ son Heracles. The Amazons who still followed Hippolyta and the Gods were separated from their wayward sisters and taken to the shores of their new home, a beautiful secluded paradise island, which they renamed Themyscira, in honour of their former home. As a penance for their subjugation they were to guard the doors to the Greek underworld of Hades for eternity, in return they would be granted immortality as long as they continued their duty to the Gods. Because of their imprisonment by Heracles and his men, and under the law set down by Aphrodite, no man was ever to set foot upon the shores of Themyscira. Join us again next week for another classic WW cover, my adventurous Amazonian associates!